Clicker training is brain training. 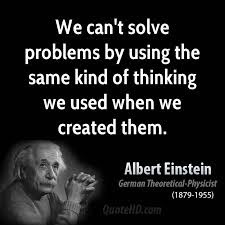 I simply have to break out of the box of conventional ideas to come up with solutions that are ethical (pain free and force free) and horse friendly (easy to understand and rewarding for the horse). This is not always a simple task with these self-imposed regulations. Sometimes it is a real challenge to come up with solutions for difficulties I encounter in my own training with Kyra. If I work for a client it’s really easy, because I am the outsider. To come up with creative training solutions for my own situation is much more challenging. That is why I like to have a mentor too. If my mentor is not available, I have to focus on what I want and how I want this instead of ‘how I know I can solve this’. Because ‘I know how to solve this’ with coercion, negative reinforcement, punishment and other methods I am not willing to use anymore. Kyra is up for a new step in her training on the long reins. 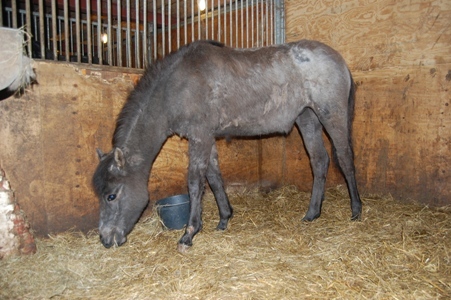 I want her to canter on the long reins. That means she has to learn to collect herself, otherwise I can’t keep up with her. I started her on a circle in canter because she was too fast. On a circle I didn’t have to run. I created a problem by staying on the circle too long. She didn’t want to follow the rail on the long side of the arena, because she thought she had to stay in a circle. Couldn’t you just use the outside rein? I didn’t want to pull on the outside rein. Her head moves up and down a lot in canter so the reins are already moving and causing too much ‘noise’ to be subtle with the rein aids. I don’t want to pull (force) her with the reins since I think the reins should stay a subtle aid. Pulling on the outside reins causes her body to bend the wrong way (outside ‘Stellung’) which is a hard problem to solve later. Why didn’t you use the whip to prevent her coming off the track? I don’t use a whip. This would only work if she is used to yielding for the whip and/or is afraid of the whip. Using a tool that is developed to cause pain, discomfort or help motivate (in a negative reinforcement way) a horse move is not what I want. I think it can be too enticing to use it for what it is made for in a moment of frustration. I don’t want to teach Kyra what she is NOT supposed to do (she is ‘not supposed to come off track’), I want her to teach what I want her to do: stay on the track. It is a different way of thinking. Focusing on what you want to teach instead of what you want to prevent. How did you solve it if you don’t use rein aids or a whip? Thank you for asking! I had to figure out a way to communicate to Kyra what it is I was looking for: staying on the track in canter. First I laid some poles next to the track parallel to the wall on the long side of the arena. She just stepped over them to make her circle. So I split the goal into smaller steps: I practised cantering at liberty and under saddle along the poles. That made it easier for her to understand that she was suppose to follow the track. It wasn’t fool proof and she was still confused on the long rein. Then I used some cones which she knows how to target. I made it really easy and asked her to touch the cone then canter a few strides to the next cone and asked her to touch that other cone. She understood quickly and so I made the distance between the cones bigger. The poles were still parallel to the track but she didn’t want to jump over them now that she was focused on the cones. Now we made really quick progress: she started to canter on the long side of the track. In 3 training sessions of 5-10 minutes I could take some of the poles away and start cantering on the other side of the arena on the long side. The next step was to fade out the cones and the two poles at the beginning and end of the long sides of the tracks. The cones were not important anymore because now I could click and reinforce for cantering on the track. Now I started to canter on the other side of the arena as well and it was no problem for her to understand to stay on the track. The next step is to change reins and practise everything she now learned in the left lead canter to the right lead canter. Now we are working on speed in canter. She is still a bit too fast and she has to learn to collect more so I can walk along her side instead of jogging. We already worked on this in session 4 and 5. 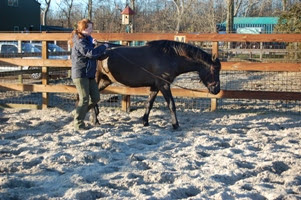 In this way I taught Kyra to stay on track and canter more slowly in only 7 sessions of 5-10 minutes. No frustration (only a bit of a brainteaser for me), no force, pain or threatening. I really like to come up with training solutions like this so I don’t have to damage the bond of trust I have been building so carefully. What are some of the force free and R+ solutions you came up with in your training? Please share this post if it was helpful. 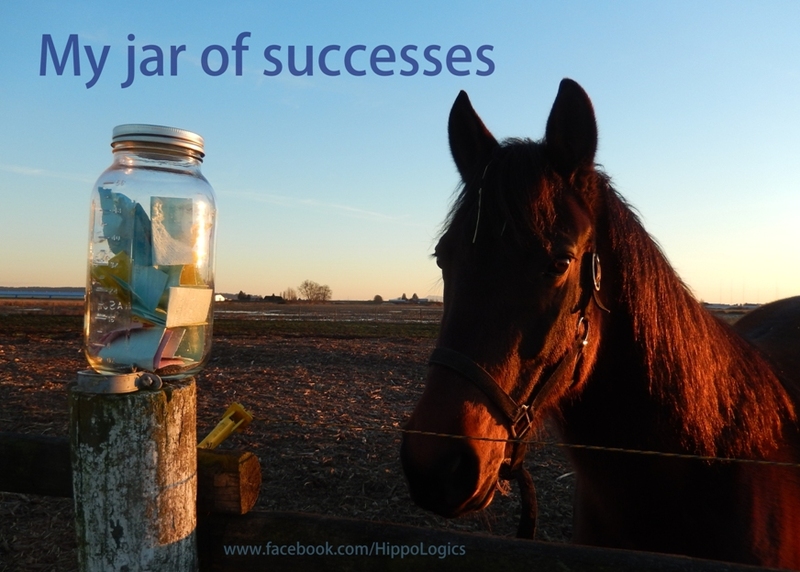 It might help other equestrians to think out of the box. What is a training plan? Is it really necessary to write it down? Isn’t that time consuming? These are the things people ask when I talk about training plans and shaping plans. You don’t have to make a training plan, but it will help you become a better clicker trainer faster. Why? Because it forces you to think about your training goal, your approach and all the steps you need to take to get to your goal. If you are at the barn and you don’t know what to do, a plan can help you move in the right direction. 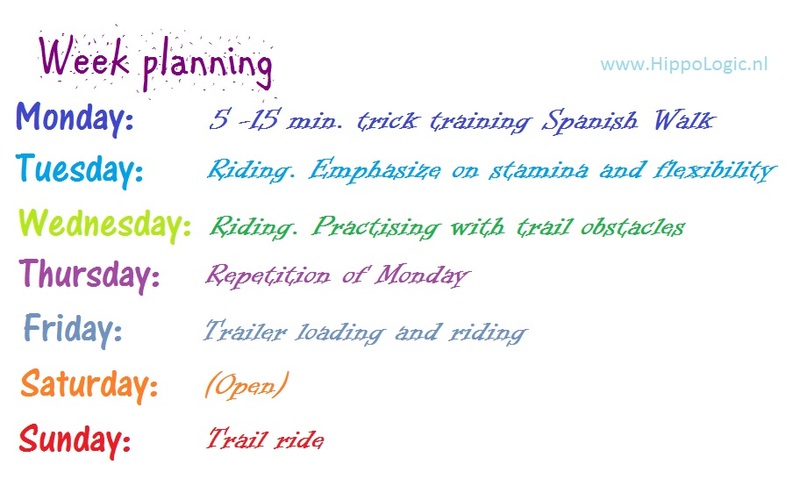 Your training plan contains all the behaviours you want to teach your horse, in your shaping plan you write down the step-by-step approach of each behaviour. First thing you have to think about and write down is your goal. What it is it and how would you recognize it when you achieve it? That is a hard question to begin with. That is one of the reasons people would like to skip this step. If you avoid it, it doesn’t exists, right? Wrong! How can you achieve your goal if you don’t know what it is you’re looking for? How can you enjoy a satisfied feeling of accomplishing something if your goal is so vague you can’t even write it down? I know it is hard, but when you practise it this will become easier and easier over time. It’s OK to start ‘big’ and write down a vague goal, the next steps will help you through the process of making it more clear. Once you have determined a goal it is easy to divide it into little training steps, the building blocks of your end behaviour. This is how you shape a behaviour. 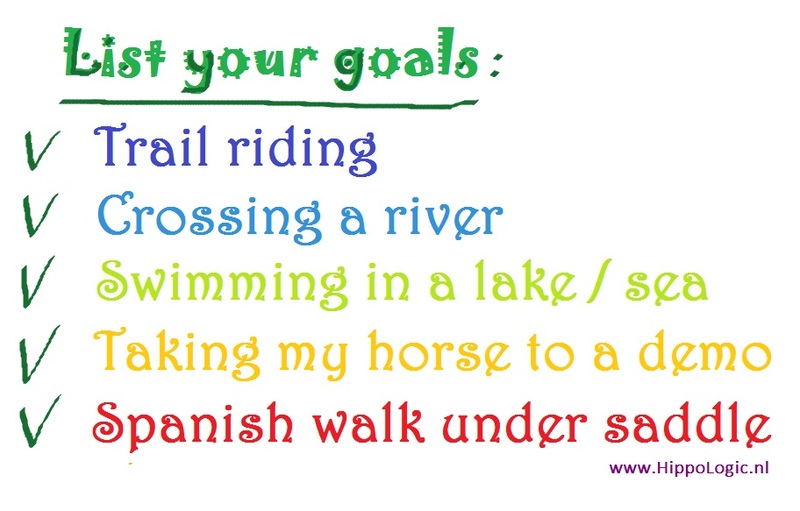 Ask questions like: what does my horse need to do in order to achieve the goal? What skills must I train first? And think about the training tools that can help in this process. 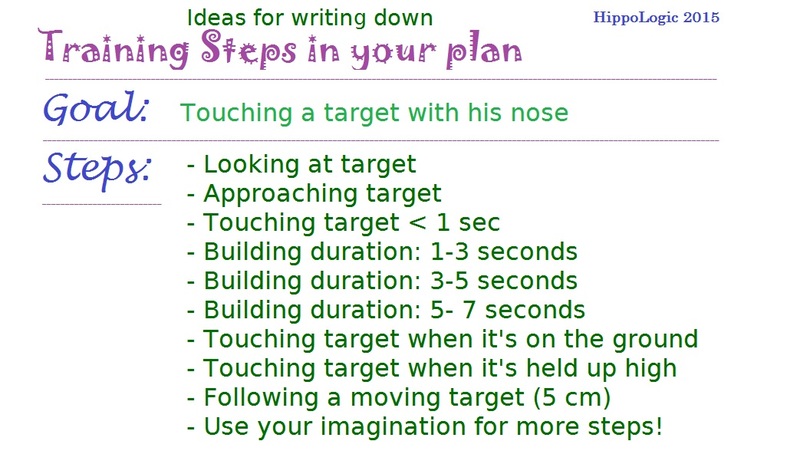 Try to visualize and write down how many times your horse must do a certain behaviour before you raise the criterion. It doesn’t have to be accurate right away, but thinking about it helps when you are at the barn training your horse. If you have set the criterion ‘Horse touches target when it’s near the ground’ you can raise it after he has done it three times. Then you hold the target in another place where the horse has to reach for it: maybe more to the left and then more to the right. It is also very important to write down which reward and how much of that reward you will be using. Some rewards will wear down their value over time in some horses. Some horses are more motivated if they get a variation of rewards. Experiment and write down what you’ve learned about your horse. It is fun and very educational to read it back one day. 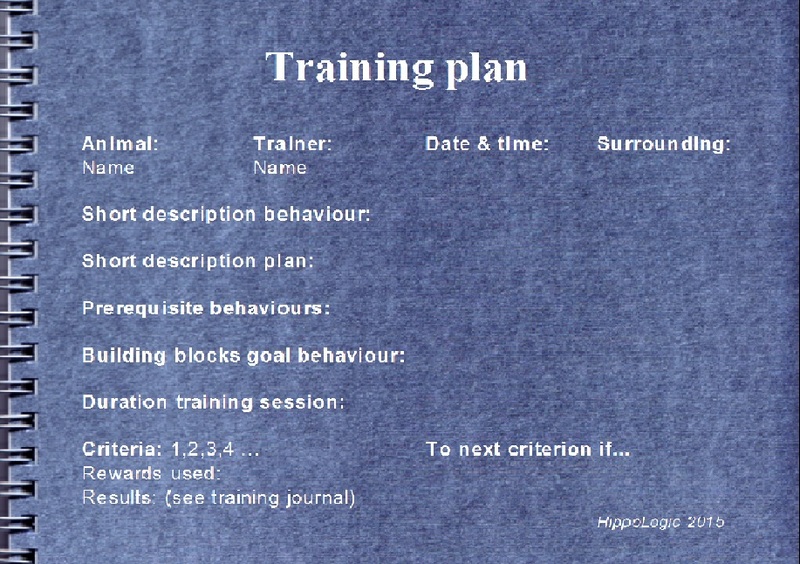 Another very important part of your training plan is to put in specific information about the target animal and things for the trainer to remember. If you read your training plan before you start training it can help you remind you of certain things like: I have to click first and take the reward out my pocket (instead of taking the treat before I click). Or remember that this horse has separation anxiety and training him works best if there are other horses in sight. Write down your results in order to start the next training at the point where you stopped or so you can take one step back to refresh the horses memory and raise the first criterion after one time instead of three times to improve and get to the next steps. Starting a training journal can be very simple and it doesn’t have to take much time. Sometimes a few simple keywords or just circling the training step where you have stopped is enough to help you remember. Have a creative clicker training!